Insomnia is genetic, research suggests. A study of more than 450,000 people identified 57 locations on our DNA that increase the risk of sleeplessness. Not only do these genes stop us nodding off, they also nearly double our risk of coronary artery disease, which can lead to angina or even heart failure. The researchers hope the discovery of these genes will pave the way towards personalised treatments that target an insomnia sufferer’s ‘faulty’ DNA. The research was carried out by Massachusetts General Hospital (MGH) and the University of Exeter. It was co-led by Dr Jacqueline Lane and Dr Richa Saxena, both from MGH’s department of anesthesia, critical care and pain medicine. ‘Insomnia has a really significant impact on millions of people worldwide,’ Dr Jones. ‘We’ve long known there’s a link between insomnia and chronic disease. Insomnia affects between 10 and 20 per cent of people worldwide, the authors wrote in the journal Nature Genetics. And around a third of cases are inherited, twin and family studies suggest. 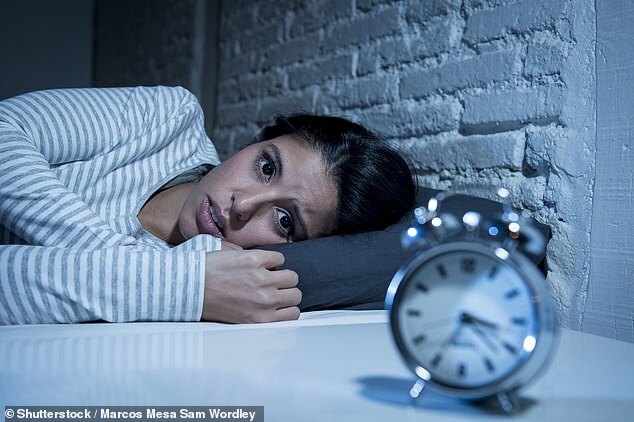 Insomnia has been linked to anxiety, alcoholism, depression and heart disease, however, it is unclear exactly how lack of sleep is involved in these conditions. To better understand this link, the researchers analysed more than 450,000 participants of the UK Biobank Study. Of the participants, 29 per cent complained of frequent insomnia. Results revealed 57 genetic locations are associated with self-reported insomnia. This insomnia was not triggered by caffeine, depression or recent stress, the study adds. Just four genetic locations had previously been linked to insomnia. The DNA sites identified included genes involved in ubiquitin-mediated proteolysis – the breakdown of a key regulatory protein. The genes were also expressed across several brain regions, skeletal muscles and in the adrenal glands. Connections were found between insomnia and both restless leg syndrome and coronary artery disease. Coronary artery disease is defined as plaque building up in the arteries, causing them to narrow and restricting blood from reaching the heart. Perhaps surprisingly, the DNA regions identified did not include genes that are known to send signals involved in sleep regulation. To test whether the results apply outside of British people, the researchers then analysed data from the Norway-based HUNT study, which was made up of 15,000 insomnia sufferers and more than 47,600 controls. They also looked at the Boston-based Partners Biobank, which had 2,200 people with an insomnia diagnosis and 14,240 controls. The genetic results of these two studies confirmed Biobank’s findings. ‘All of these identified regions are possible new therapeutic targets for insomnia, and 16 of these regions contain known drug targets,’ Dr Lane said. The researchers then looked at a subset of 85,000 Biobank participants, who wore an accelerometer for up to a week. These results suggested those with the insomnia-related DNA regions had worse quality sleep, slept for a shorter amount of time and varied day-to-day in the amount of shut eye they got. ‘We hope understanding more about the underlying processes involved in insomnia will pave the way for better and more personalised treatments,’ co-author Dr Michael Weedon – of Exeter’s college of medicine, nursing and allied health professions – said. Existing insomnia treatments can lead to addiction and side effects, Dr Weedon warns. These adverse events can include constipation, change in appetite, and tingling hands and feet. The researchers must now investigate how these genetic changes lead to insomnia. ‘This requires studies in human cells, mice, fruit flies, zebrafish and other model organisms,’ Dr Saxena said. ‘In addition, detailed studies that more precisely define the causal links of insomnia to clinical outcomes are imperative.